Hey there friends. What a weekend of football it was this weekend. A 470+ yard passer loses the game, an emotional game for a kicker, a crazy 76 yard field goal attempt, 6 TD tosses in 3 qrts, NFC giants clash in an epic game... I mean, man, was there some good football out there. Let's get to the games I was able to watch. 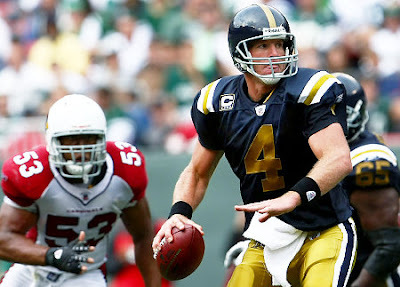 Story of the week, football god, Brett Favre, throws 6 TD in a game against the Cardinals. For all the feats he accomplished in Green Bay, never once did he throw for 6 TDs in a game. The Jets looked formidable on offence. Potent. Favre looked comfortable for once. He did not look confused at times and the Jets did an awesome job on changing the scheme of the plays instead of changing Favre. Favre is a veteran and the Jets should have changed their play book to accommodate his skills, not have Favre learn all sorts of new formations and plays that did not utilize his skills. We finally saw those 4, even 5 wide out formations that gave Favre the chance for the long bomb and it paid off huge for the Jets. The defence, however, coughed up 30+ points to a Cardinals team that was not in it's A game. The Cards spent the week over in the east coast instead of flying back and forth, to better rested and prepared for the game. It didn't work. Even though Kurt Warner threw for over 470 yards, the offence never seemed to be on the same page. He tossed a few interceptions, fumbled on a few occasions, but Fitzgerald and Boldin refused to go down without a fight. That is one killer combo and if they can keep Warner on his feet(or in the near future, USC's Matt) then this combo can do some major damage in the NFL. On that note, Boldin suffered from a monster hit when he was sandwiched between 2 defenders with .30 left in the game. He was hospitalized for precautionary reasons but looking at that hit, it definitely looked more severe than it was. The football gods were smiling down on him and hopefully, he'll be back on the field real soon. I must admit that I did not have my full attention on this game. My brother was over at my place during the early games and he brought his laptop, which needed some fixing. So while doing that, I was tuning in on the games. The story in this game was the death of Matt Bryant's 3 month old son. Sad, sad, times for the Bryant family. His son died in his sleep. I am not sure what the cause of death was, but I'm leaning more towards SIDS, since it's something that terrifies the hell out of parents since no one knows the causes and takes our little ones without warning. Our prayers are with you, friend. As for the game, sloppy play by Aaron Rodgers. His inexperience crept out in this game causing him to toss 3 INTs. Give credit to the Bucs defense, though. They looked sharp and pounced on Rodgers' mistakes making him pay. Their great D is also to blame for Rodger's injury. Running from pressure, Aaron took off running for a first down, Bucs defender catches Aaron's ankle causing him to land face first, or should I say shoulder first, causing a separated shoulder. He came out of the game for a short series, but came right back to toss a TD pass. After the throw, however, you can tell that he was ailing and was favoring his throwing shoulder. If Aaron is hurt, Green Bay will be in big trouble. They gambled on Rodgers to be their man, but they do not have a legitimate back up for him. They have 2 rookies that are unproven and without experience with the first team. I look for Green Bay to sign a veteran QB real soon as an insurance policy. Will Culpepper wear the green and yellow in the near future? Duece is back and the Saints are waaaaaay better because of it. I don't know what the deal is with Reggie. The man is a stud that should be able to showcase some of the talent that oozed out of him at USC but it just hasn't happened yet. Duece, however, comes back and immediate shows Reggie how it's done, running for 70+ yards and a TD in his return. If the Saints can find a way to mingle these 2, these Saints can be unstoppable. Brees can play, tossing over 350 yards and 3 scores, so you know you'll always have a chance to win with him behind center, the defence is not outstanding, but gets the job done, and their 1-2 combo of Duece and Reggie has potential to be one of the best. Overall, this is a team that will lose if they lose the games themselves. Reggie is prone to fumbling, Brees could have a bad game, Duece is back, but I doubt at 100%. If this team can keep those turnovers to a minimum, they will be a force to be reckoned with. I'm an Oakland fan. I keep a close eye to the AFC West and KC pulled a rabbit out of their hat and showed up to dismantle that atrocious defence of Denver. There is no doubting that the Denver offence is good. They have a great, young receiving core in Marshall and Royal and they have a blossoming QB in Cutler that is well ahead of the curve for his age. This team is going places, but only if the defence pays attention. KC's Larry Johnson just cut 'em up for close to 200 yards on the ground, keeping Cutler and his crew on the sidelines, limiting his chances to pull a comeback. KC is still a long ways from being anything. Huard is not the answer for KC and he's merely in there to manage the game. He did toss a spectacular pass to Gonzalez in the corner of the end zone. The outstretched Gonzalez did his part by stretching out over the defender to get his hands on it. He landed awkwardly and held on for the TD, but he came up gingerly and seemed to have some bruising in his midsection. Those were the morning games that I was able to catch. Still working on my bro's laptop. But once 1 PM rolled around, I put that thing down and focused on the Raider game. This Oakland team is beginning to frustrate me. They are better than their 1-3 record indicates. They suffered a tough loss to a top ranked Bills team last week on a last second field goal and again, loss this game in the final minutes of the 4th qtr to a tough, tough SD squad. Russell came out of his shell in this game. The offense finally opened it up and let him spread his wings. The passing game showed brilliance in the first half, highlighted by a 60+ yard pass to TE Miller for a TD. The defence was outstanding. Limiting the Bolts to practically nothing in the ground and several 3 and outs. The Raiders were feeling so good about themselves that they even attempted a 76 yard field goal. That's right, 76 yards!!!! Janikowski has a leg that can make that type of kick. He's rumored to hit 80 yarders during practice so it was only a matter of time before they gave him a chance during a game. It was the final seconds of the first half so it didn't hurt the Raiders to try. Then.... the Bolts woke up. 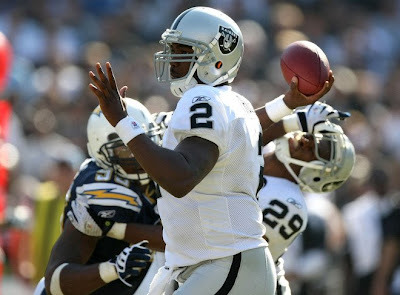 Rivers led his team to a lengthy drive to start the half limiting and reducing the momentum that the Raiders had. After a few 3 and outs for the Raiders and costly INT, Rivers led his team in the 4th qtr to finally take the lead over the Raiders. The Raiders fought back, to tie the game on a field goal with a little over 2 mins left, but on the following kick off return, SD ran it back 60+ yards to put the Bolts in a commanding position. That return was a killer. All SD had to do now was give LT the ball, who was having a quite game due to the Oakland defence. LT gashed the Raiders on a 4o+ yard score and that was that. Raiders are there. The team just does not know how to finish a game. The 4th quarter is killing this team and I want to say it's because of Russell's inexperience. It's tough to finish a game with a semi-rookie (only started a few games last season) who has not found his rhythm yet. He's getting there, though. He looked good in this game. Was not timid to toss the ball down the field and as a testament to this man's arm strength, get this. As Russell was scrambling away from the SD defence, will falling away he tosses the ball close to 70 yards down field nearly completing the pass that was broken up the SD defender that did not quit on the play. Give that man credit for recognizing Russell's strength because I doubt that anyone else, besides Favre, would attempt and possibly complete a pass that hung in the air for close to 70 yards. What a game. 2 NFC powerhouses clashed and it did not disappoint. Dallas is a heavy favorite to not only win this division, but to go on and represent the NFC in the super bowl. The Skins have their plans to win that division and they came to play. The Skin's D kept Owens in check most of the game, even though Dallas attempted to get him the ball. He ended up with 7 catches and a score, but the Dallas receiving core was pretty well rounded in terms of catches. 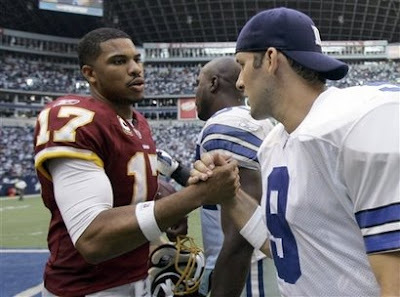 Romo threw for about 300 yards and 3 scores, going toe to toe with the Skin's Campbell. In contrast to the Dallas balance, Washington showcased a strong dual in Portis and Moss. 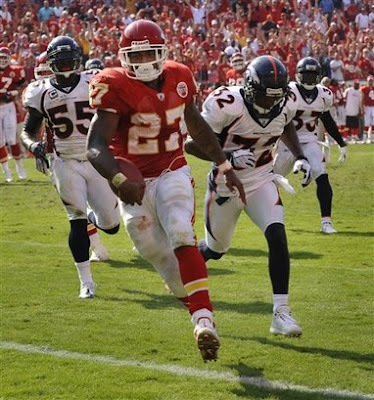 Clinton Portis finally broke one free and rushed for over 100 yards. If you can run the ball, you hold on it to longer and in this case, you needed to hold on to the ball to limit Romo and TO to make that comeback. But it wasn't all Portis, Santana Moss came up big with close to 150 yards receiving, making it look like child's play, constantly burning his defender. In the end, Romo with no time outs, marches his squad down the field for a score with close to a minute left. The onside kick is attempted and it looks like Dallas has it, but it slips right through the hands of Dallas receiver Sam Hurd. Just like a heavy weight fight that goes the distance, this was a good one. As for Dallas, they forced the issue with TO. I think Romo lost some good opportunities down the field because he was forcing the issue with TO. I understand that he's a playmaker, but if the play is not there, check down to the second or third option. Of course, TO complained that he didn't get enough catches and the man will derail this offence if his "divaness" rears it's head. He's been quiet these pass few seasons and that's because the team was winning, but if the team loses another one in the near future, expect some fireworks to coming out of his mouth, burning his own team and their super bowl hopes. This Bears defence is beginning to impress me. Donovan was beginning to look like the Donovan of old, torching some defences, but the Bears kept him and the Eagles in check. 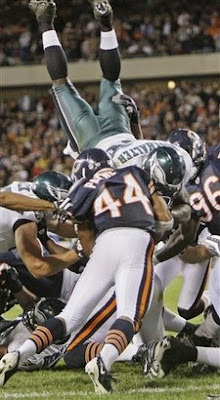 Donovan was good for 1 TD and 1 INT for about 250 yards but the Eagles needed just one more to win the game. On their final possession, Donovan leads his team 70+ yards down the field to the Bears 1 yard line. Knowing that 3 points will not suffice, the Eagles go for it on fourth down to punch it in. Bears D came to play and held the Eagles to their side of the line of scrimmage, winning the game on their spectacular goal line stance. The Bears D wasn't the only one that shined for the Bears, despite throwing 2 INTs, Kyle Orton is showing the Bears that he has what it take to win the game by tossing 3 TDs in only 18 completions. The Achilles heel for the Bears has been the play of QB Rex Grossman. The defence has always been great and the team merely needed a QB that would not lose the game. Rex was a crap shoot every game. You just did not know what you were going to get with him. Now that Orton is in there, you know that you're going to get points on the board. He's a more accurate thrower and if given the chance, will chuck it down field for the big play. You also know that he's effective in the 2 minute drill and will not buckle the way Rex did. This wasn't his best game, but he showed his team that he can be counted on, and that's huge for a team that struggled with QB issues for the last few years. you're right dude!!! Favre's a football god! !